Video takes too long and photographs don’t say anything — visual note-taking is the perfect medium for capturing your live event. Think of it as cartoon journalism: I listen for the stories and ideas worth stealing, then I turn them into images that are fun, instantly digestible, and easily shared around the web. I love teaching folks how to take notes with pictures, words, and visual thinking. My workshops can be tweaked for almost any environment or occupation. 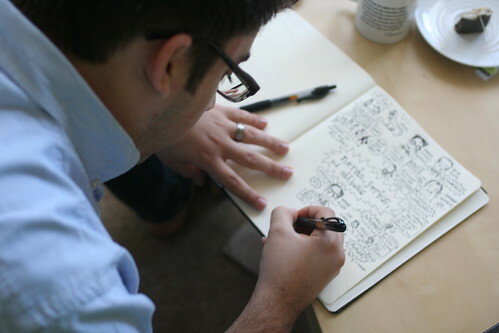 It’s easy to learn the basics of visual note-taking.